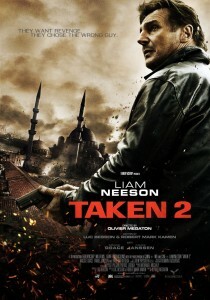 Taken 2. Having seen Taken 1, I must admit to wondering how they could squeeze much more out of one man’s family. But they did. Here are my incidental ramblings, by no means fully formed, about Taken 2. Reciprocity was the standard of rightness, fairness and justice in Old Testament times. On the one hand, this is good, because it prevents people from the natural tendency to do more damage in retaliation. The problem with revenge is as is beautifully noted, “If you kill my dog, I will kill your dog and your cows and your chickens – I will show you not to mess with me!” says James Bryan Smith ‘The Good and Beautiful Life’. Those who kept the law or reciprocity thought they were being good and right. But where does that leave grace and forgiveness – both powerful and surprising weapons. Like I say, these are just thoughts. Lord help the scriptwriter for the, soon to be commissioned, Taken 3. Mind you, there were some pretty breathtaking roof top chase sequences in Taken 2. This entry was posted in Blog and tagged Action, Film, Genre, Liam Neeson, Musings, Taken 2, Thoughts. Bookmark the permalink.